At ArtFactory.com, we make all styles custom garden sculptures and fountain heads. This Kokopelli, iron and copper fountain statue features a water spout flute. These custom sculptures are not mass produced, but are in fact, one-of-a-kind, works of fine art. These fountain heads are not cast, drop forged, built from a mold, or any other fast process. Each piece is handmade by master blacksmiths with hammer and anvil over a coal fired forge. This makes for a product that is uniquely yours, and will never be exactly reproduced. Furthermore, our standard building material for our custom garden sculptures is pure solid wrought iron. We use iron because it does not rust and corrode with exposure to the elements like cheap filler metals. Wrought iron lasts for centuries, and builds a patina, only looking better over time. In addition to wrought iron, we also forge sculptures from top quality, solid brass, copper, and precious metals such as gold, silver, or platinum at your request. Top grade, hand forged metals make the difference between a fountain that will stand the test of time, and cheap, disposable throw away products that are found at big box retailers. Kokopelli is well known throughout the Southwestern United States from the various stories told by the local Native American tribes. He was especially prominent in the Anasazi culture, we have seen his figure in many petroglyphs, and is known among the various Native American tribes in the Four Corners area. He is usually portrayed as a humpbacked flute player, as shown on the door. It is likely he was a traveler through the Southwest and Mexico. Tribes alternate their descriptions of him as a storyteller, magician, teacher, and healer. However, most tribes consider him a fertility symbol; when Kokopelli arrived so did good harvests, rain, and luck. He was welcomed everywhere he went. 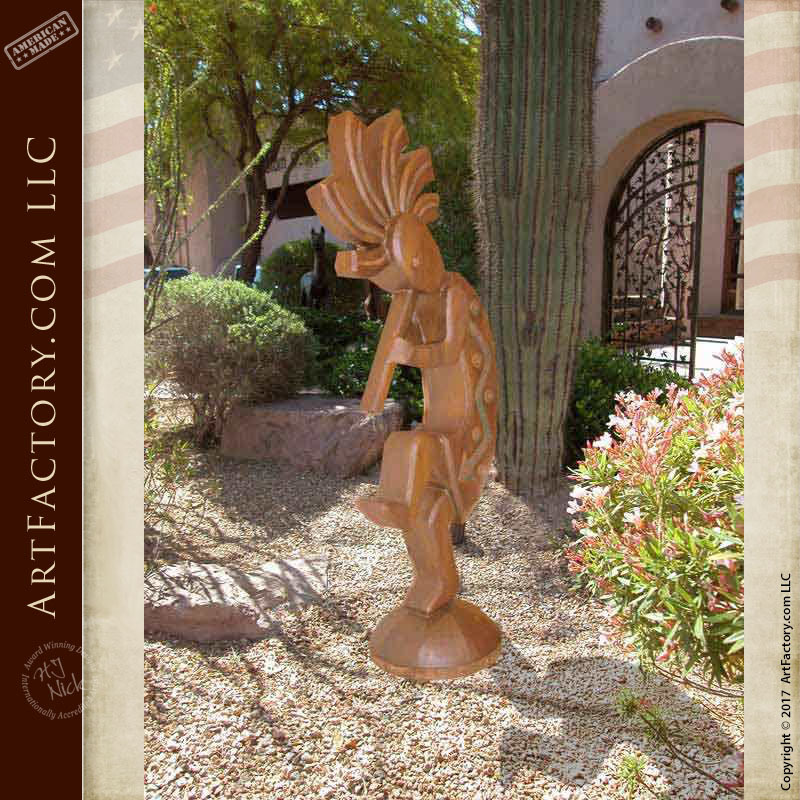 Bring a little prosperity into your home with your own Kokopelli custom garden sculptures. ArtFactory.com, an American manufacturer of custom door hinges, door straps, wood doors, iron gates, and designer furniture based in Scottsdale, Arizona, and Designs by H.J. Nick, have been designing and building some of the world's finest furnishings, all hand crafted in America, since 1913. Most of our clients want a furnishing that has a big WOW factor and timeless elegance. They all want investment value furnishings that make a proper statement reflecting their personality, or the personality of the environment for which the designer custom furnishings are intended. Our master level craftsmanship ensures your custom wrought iron gates and furnishings will stand the test of time, and are guaranteed forever, backed by over a century of fine craftsmanship.